In recent years I’ve really gone off rock clubs. Too often they really do take themselves seriously, and so, so many of them seem to insist on playing the same tracks in the same order every week and making the minimum effort possible. An awful lot are TERRIBLE at online and social media and therefore fail to create any sort of excitement or buzz about their night. This is particularly troublesome with weekly nights, since there are inevitably going to be weeks where it’s extremely difficult to get the punters through the door, and a lazy approach to proceedings is hardly going to help. Many are struggling and/or shutting down up and down the country against a difficult economic backdrop and frankly, I’m not surprised. However, for a couple of years now I’ve been following the online buzz of semi-regular rock night Last Resort but for one reason or another never made it down until Last Resort 9 in June this year. I quickly concluded that it is by some distance the best rock club I’ve ever been to, for a variety of reasons not limited to the below..
1. It doesn’t even try and take itself seriously. 2. The music is largely rock emo, nu-metal and pop-punk from the early 00’s when most of the crowd were growing up. 3. There are regular social media updates on Facebook and Twitter, not just from the official accounts but from the promoters themselves, creating a buzz from months beforehand. 4. Every night is a separate ‘event’ to be treated as such. It’s only on a few times a year, which means it’s always rammed. 5. The music is amazing. Yes, it’s not to everyone’s tastes, and (bizarrely) not everyone wants to hear 8 Limp Bizkit tracks in a night BUT equally nobody is apparently afraid to drop a Katy Perry, a Rihanna track or even bloody Usher when the moment calls. And why should they be? In this day and age nobody wants to hang around with people who think they’re too good for pop music, especially after a few drinks! 6. There appears to be about 20 DJ’s. Presumably they are only playing a few tracks each, but it means there’s a great buzz around the decks. 7. It’s completely FREE and is bang in the centre of London. 8. Oh and everyone, without exception, is completely battered. 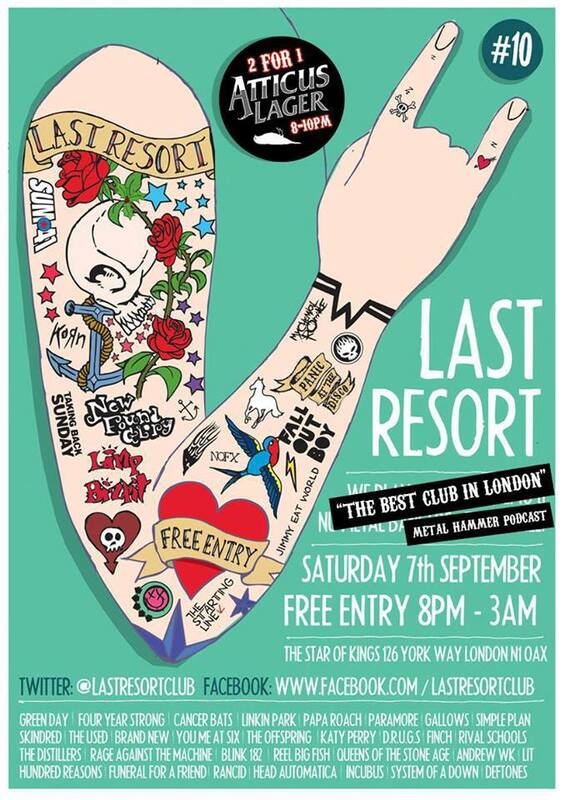 The next one is Last Resort 10 on Saturday 7th September it’s at The Star of Kings in Kings Cross, and it’s completely free! In the meantime, get involved with the banter on Facebook and Twitter.